He likes lasagne and cookies and cream ice cream. His favourite movies are the Lord of the Rings trilogy. He lists his hobbies as speedway and listening to music. In other words Hayden Sims is a typical teenager. 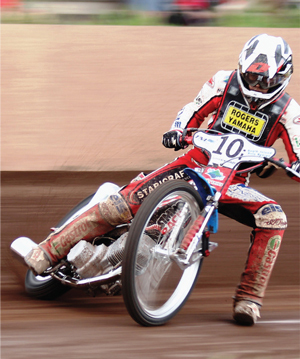 He also happens to be pretty good at one of his hobbies, with several speedway titles to his name and his eye fixed on becoming world speedway champion. Hayden, from Kapuka in Invercargill where he lives with his mum Maree, dad Darryl and brother Bradley, is in Year 11 at Verdon College. He is Ngāi Tahu through his mum Maree (nee Weir) and a descendant of the original settlers of Whenua Hou (Codfish Island). Goals: To become national under 21 champion, national champion, race professionally in Europe, and become world speedway champion. Started racing: On November 15, the day after he turned 12. Contracted to Oreti Park Speedway Club and has just been granted dispensation to race as an adult (500cc bike).